What is the best way to deal with a flight delay? You’re ready for take-off… but your flight isn’t. Here are some tips for making a flight delay a little more enjoyable. You’re totally pumped up for your getaway (or your return home), then it happens – you’re at the gate when the dreaded announcement is made. Flight delays happen, but why not turn lemons into lemonade?. Many airports around the world are practically malls where you can shop ‘til you fly, but some offer some additional amenities and perks. Here are some ways to make the most of your ‘extra’ time in the airport. EXPLORE It’s true, not all airports are alike. The best airports have created amazing experiences within the airport. Take Amsterdam’s Schiphol which has a satellite location of the famed Rijksmuseum and a casino. Many others (like Vancouver International) have stunningly designed facilities that are a delight to explore. 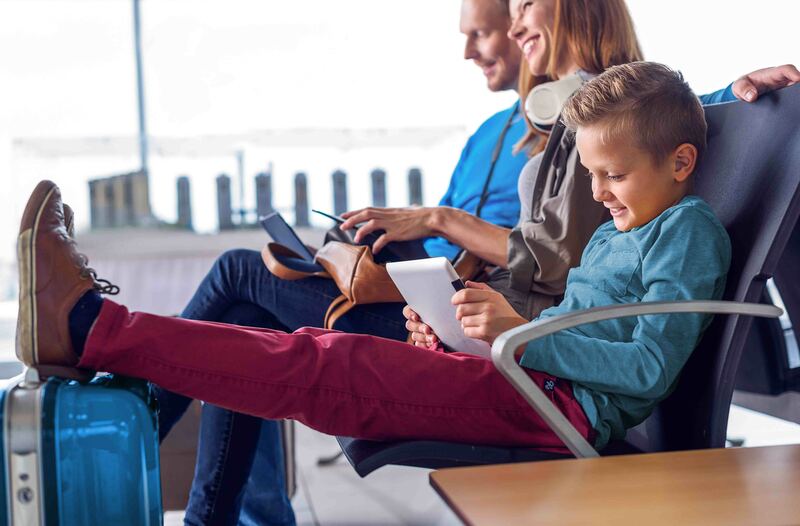 PLAY Many airports recognize that flight delays, especially when you’re travelling with kids, can be tough. But fortunately, more and more are offering play areas where kids can run, jump, and slide their way to fun. Plus, others like Calgary’s International Airport have other amenities like arcades. ESCAPE If your flight is delayed for more than a few hours, check with the airport to see if they offer excursions away from the airport. Some offer city tours, and others will take you to other local attractions (like Iceland’s Keflavik airport which offers excursions to the Blue Lagoon). FEAST Forget cafeteria-style food. Over the past few years many airports have stepped up their food game and now have restaurants of famed chefs, and a taste of the best culinary experiences their cities have to offer. So why not turn your extra time into a food tour?. RELAX Don’t stress the delay. Some airports now offer gyms, spas, movie theatres and even butterfly gardens (Singapore’s Changi) where you can chill out. And if the airport you’re stuck in doesn’t have an extra special attraction, you can always rack up some steps by strolling through the airport or playing a game of I-spy with your kids. If you would rather not face a delay, experts say you can minimize your chances by booking early morning flights which are less likely to face major delays. Those tend to accumulate as the day goes on. Always remember to check your flight status before heading to the airport – that way if a delay has already been posted, you can spend a few extra hours in the comfort of your home or hotel room. Now there’s another way you can deal with a flight delay in a relaxing way. With Blue Cross travel insurance, you automatically get the benefit of our new Serenity Service. This exclusive perk will give you access to an airport lounge if you’re delayed for more than 3 hours. And, if you’re delayed for more than 6, you get a hotel room (even if your delay is during the day) so you can relax, take a nap, or even a shower. Serenity Service is offered exclusively and at no extra charge by Blue Cross travel insurance. Get a quote.